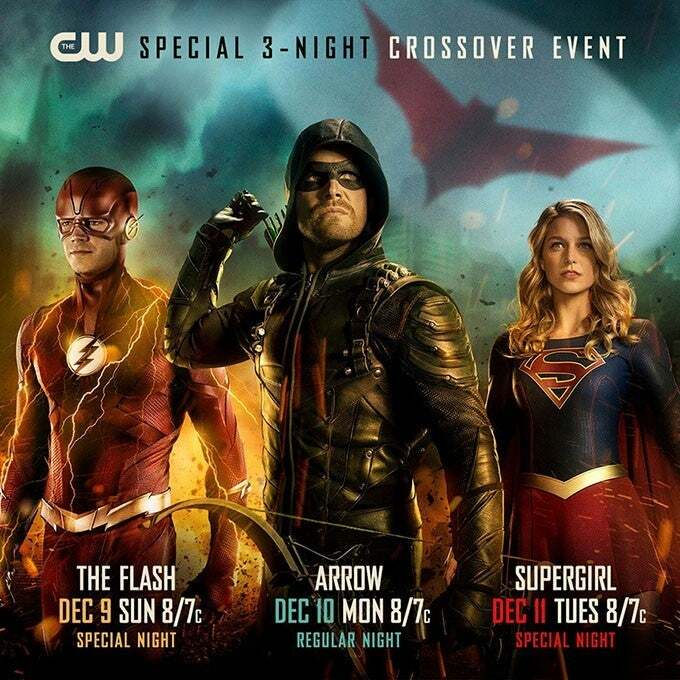 The CW announced the dates for its annual crossover event earlier today and now the official poster for the crossover has been unveiled as well. Arrow star Stephen Amell shared the poster to Twitter and as you can see below, it features Barry Allen/The Flash (Grant Gustin), Oliver Queen/Green Arrow (Stephen Amell), and Kara Danvers/Supergirl (Melissa Benoist) ready to take on whatever threat they face during the event while the symbol for Batwoman fills the sky behind them. You can check out the poster below. The poster also features the dates and times for each episode of the crossover. The event will kick off with The Flash on Sunday, Dec. 9, and will be followed by Arrow on Monday, Dec. 10, and conclude with Supergirl on Tuesday, Dec. 11. Each installment will air at 8 p.m. ET. Fans of the network's DC Comics-inspired shows will note that The Flash and Supergirl are trading time slots for the event — Supergirl is set to air on Sunday nights while The Flash is a regular fixture in the Tuesday night slot — while Arrow will air in its new normal slot of Monday nights. As the looming presence of Batwoman's symbol in the background of the poster illustrates, the hero will make her debut during the crossover as announced during the network's upfronts presentation in May, a debut that marks the first live-action appearance for the character. "This is the first time ever that she will make a live-action appearance on any screen," network president Mark Pedowitz said in May. Earlier this month, the network announced that Ruby Rose had been cast as Kate Kane/Batwoman for not just the crossover, but the in-development Batwoman series for The CW as well. Batwoman will be the first openly lesbian superhero to lead a television series and for Rose, the opportunity to play the character is an emotional one. "I get to be Batwoman," Rose told Jimmy Fallon. "I feel like the reason I kept getting so emotional was because growing up watching TV I never saw someone on TV that I could identify with, let alone a superhero. [Tearing up] I said I wouldn't do that and I've always had this saying, well not me, Oscar Wilde, which is 'be yourself because everyone else is taken' and so I always lived by that motto and the second motto when I came into the industry was 'be the person that you needed when you were younger' and I feel like one motto sort of led me to the other and I just kept crying about it." The Arrowverse crossover will Sunday, Dec. 9 through Tuesday, Dec. 11 on The CW. The Flash's fifth season will premiere on Tuesday, Oct. 9th at 8 p.m. ET, followed by Supergirl's fourth season on Sunday, Oct. 14th at 8 p.m. ET. Arrow's seventh season will premiere on Monday, October 15th at 8 p.m. ET, with Legends of Tomorrow debuting Monday, October 22nd, at 9 p.m. ET.